Betfair is one of the biggest betting sites in the world. It has set the bar for betting exchanges and more bets are placed here on a daily basis than on any other betting site. But despite that, there are many users that avoid this website, many users that have issues with everything from the system itself to the customer service. So what is it about this site that divides the gambling community? Betfair is a betting exchange, not a sports book. Well, it is that as well, but they are most known for their exchange. This means that you are not betting against the site, but rather you are betting against other players. You won’t see these players, nor will you interact with them. The way it works is that you will be faced with two options when placing a bet. You can either choose the “Bet” option, which is shown in blue; or you can choose the “Lay” option, which is in red. Both of these options will display exact decimal odds, alongside other odds. 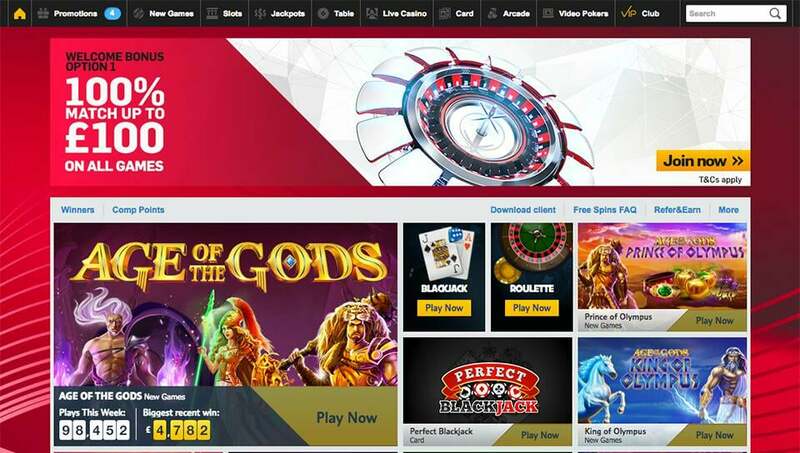 These other adds are less enticing and will only apply if you take all of the money offered by the highest odds and therefore need to opt for an additional offering, or if you are the one providing the lay and are competing against the odds on show. If this sounds complicated then don’t worry. You can just focus on the blue option, betting like you would on a sports book. The good thing about the exchange is that there is so much competition. There is always someone trying to outdo someone else, and this means that you will find the very best odds here. Betfair exchange odds often outdo the very best sports books, and the odds you find on the outside bets are often double if not triple what they are on other sites. Betfair has a rather complicated layout. It may take some time to get used to it, but once you do, it’s very easy to navigate. There are live streams, live betting and more. There is also an extensive number of markets to choose from and Betfair has some of the most obscure events in the industry. The problem is that they don’t always have the most varied markets for those events. Still, if you’re focusing on the major sports and the major leagues, you will be able to choose from an extensive number of bets. As far as cricket goes, all of the main international competitions and domestic competitions are covered, but once you start dipping into domestic cups and second tier competitions, there are very few markets available. That’s because someone needs to be creating the market and offering the odds for it to exist, and that just doesn’t happen with events that aren’t very popular and events that aren’t televised. 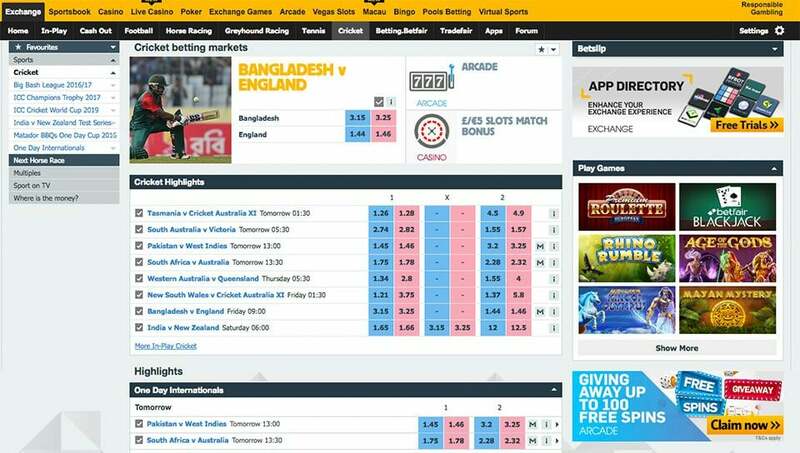 As well as the exchange, Betfair also has a sports book. The odds are smaller, but the layout is easier for the inexperienced user and there are also a few more markets available. Betfair also has an arcade section, a casino section, a bingo room, poker room and exchange games. It is one of the most complete betting sites in the world. On both the exchange and the sports book (as well as the Betfair Exchange Games) there is a minimum bet of £2. This applies whether you’re placing a large accumulator or whether you’re betting on the turn of a card, and it’s something that puts many casual gamblers off. This is an area in which Betfair disappoints. Betfair are not the ones offering the odds, so they do not benefit when you lose money. Instead, they take a very small cut of each bet. This is barely noticeable to the user, but it adds up for Betfair. This means they are often reluctant to give free bets, simply because those bets are not going into their pockets. There are few, if any, promotions on the exchange and when they do appear, they are rarely worth the time or the effort and they are certainly not enough to compete with the promotions offered by the biggest sports books. This is not the case with the casino, poker room, arcade and other sections of the sites, but it remains to be the case for the sports book. For whatever reason, they don’t even offer many promotions on that section. Betfair do not have the best customer service in the industry, but they might have the worst. We do not have the best experiences with Betfair support and have heard some horrible stories. There could be a number of reasons for this. Firstly, Betfair is huge and they are probably stretched thin as a result. Secondly, they are less inclined to offer free bets as a way of appeasing irate customers because they don’t profit from those free bets like a typical sports book would. But excuses aside, this is a massive issue and it’s one that they need to resolve if they are to continue to grow. It’s difficult to get a speedy response, it’s difficult to get any sense out of them. On the plus side, there will be very few occasions in which you actually have to deal with them. On the downside, if you ever do, and if that issue is not something that can not be fixed immediately, then prepare for a very frustrating experience. There are plenty of banking options on Betfair and there are definitely no shortcomings in that department. There have been issues with Australian wallets and Worldwide wallets in the past and it was often frustrating to have to navigate this, but they have since knocked that setup on the head and things are now much easier to navigate. There are options for PayPal, Skrill and everything else you could hope for. And everything is processed very quickly, especially if you use a web wallet like PayPal. There are many positives here, but there are also many negatives. That’s why Betfair divides this industry. But the truth is that those negatives diminish somewhat if you’re a frequent gambler and if you gamble with a lot of money. A standard betting site is judged on a few basic factors, many of which we looked at in this review. But with Betfair, it’s all about you. If you’re a casual gamer who likes to bet small and to pickup as many bonuses as they can get, Betfair is not for you. There are better alternatives out there and the lack of bonuses, the “high” minimum bets and even the layout may not be your sort of thing. If you’re not perturbed by this minimum bet and typically gamble a lot more. If bonuses don’t usually apply to you anyway (because you gamble with too much money to ever bother with a free bet of £10 or £20) and if you understand decimal odds, as well as lays, then this is the ultimate betting site. It’s not perfect, nothing is, but if that sounds like you, then you will struggle to find anything better.